Value range - $989,000 to $1,028,900. Gorgeous home in desirable La Costa Valley w/loads of upgrades! New flooring throughout, new SS appliances, new paint & new AC. Fantastic floorplan w/soaring ceilings has 4 beds(1 bd & ba down)+ enclosed loft/optional 5th bed. Mstr suite w/dual vanities & soaking tub. Wonderful yard w/patio area & grassy area. Located on a quiet street that ends in a double cul de sac. Residents enjoy The Valley Club w/pool, gym & tennis.Top rated Encinitas schools., Value range pricing - $989,000 to $1,028,900. If you've dreamed of living near the coast in one of the most desirable communities in San Diego County, this is the house for you! This two story residence boasts loads of upgrades including new flooring throughout, new interior paint, new baseboards, new AC, and new stainless steel appliances. The sunny kitchen features a large center island, breakfast nook, and loads of cabinet space. The kitchen flows seamlessly into the inviting family room with cozy fireplace. Entertain friends and family in the wonderful formal dining room and formal living room with two story ceiling. Adjacent to the living room is a convenient flex space that would make the perfect office or music room. An oversized bedroom and full bathroom complete the downstairs. Upstairs, you will find the expansive master suite with vaulted ceilings and plenty of room for a sitting area. The master bathroom features dual vanities, a soaking tub, and walk in closet. On this level, there are two more bedrooms, a huge enclosed loft, and another full bathroom. The serene backyard is highlighted by a patio area and lush grassy play area. 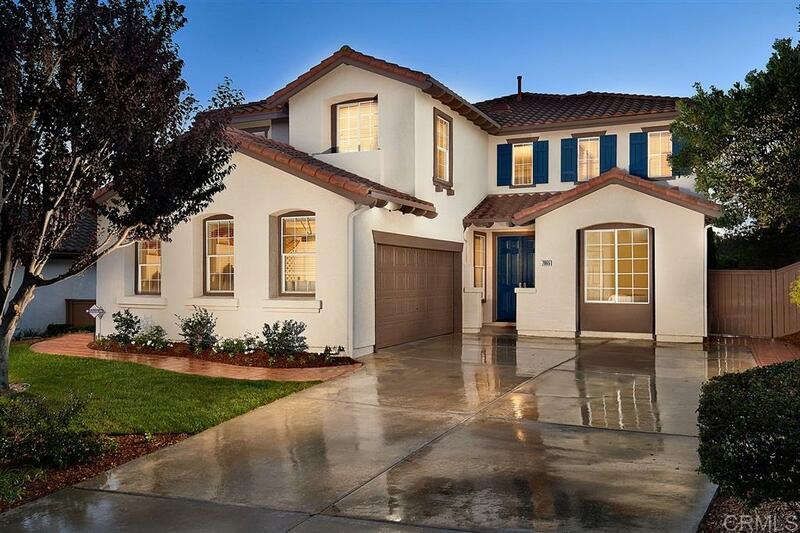 Located in highly sought after La Costa Valley which offers community events such as Easter Egg Hunts, 4th of July Parades, Halloween Parties, Memorial Day BBQ's, and so much more. La Costa Valley also features âThe Valley Clubâ with huge sparkling pool, soothing spa, wading pool, fitness center, recreation room, and a central courtyard which makes the perfect spot to host private events. Loads of walking trails wind their way through the neighborhood, and there are lots of parks throughout the community. Top rated El Camino Creek Elementary is just a few blocks away. Fabulous shopping (H&M, Loft, Victoria's Secret and many more) and delicious restaurants (Casa de Bandini, Panera, Urban Plates and many more) are located a short walk away at The Forum. Hop in your car for a quick drive to popular beaches including Moonlight, Ponto, Beacon's, and Stone Steps. This is truly Southern California living at its best!